One of nature’s most spectacular shows might just be aurora borealis, also known as the Northern Lights, a strange dance of green lights that glows overhead in the Arctic, and it just so happens that the Northern Lights in Fairbanks Alaska is one of the best places on earth to see them. Seeing the lights with my own eyes one day had always been a goal of mine. But readers of this blog will know that I’m a firm believer in making someday a definitive date. 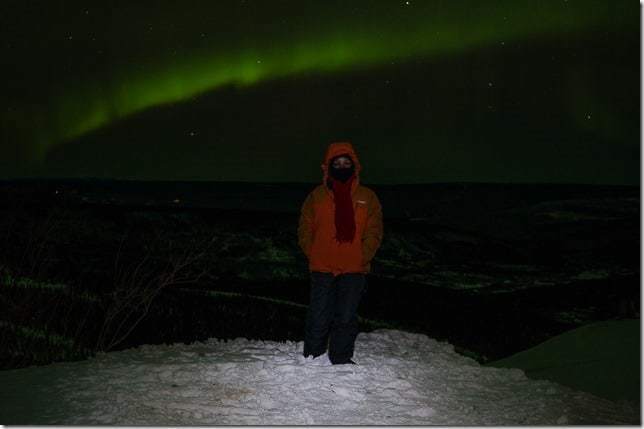 Since our time in Medellin, Andrea had also been talking about how one of her ‘bucket list’ items was to see the Northern Lights. So, after returning to Seattle we decided to just make it happen. 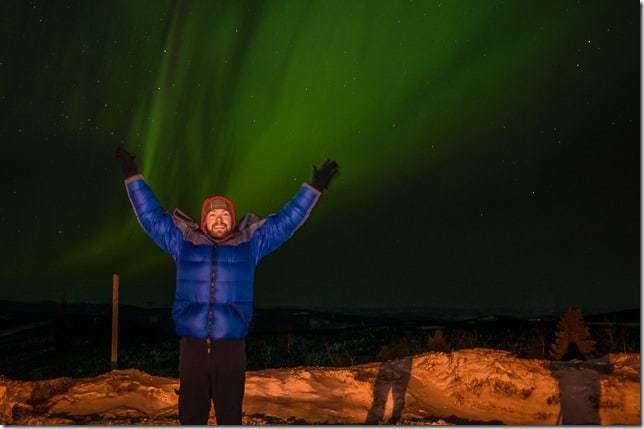 It would be a shame for her to be so close and not get up there to see it… And it was her birthday, so we decided to do something memorable and chase the Northern Lights in Fairbanks Alaska! Flights to Fairbanks Alaska, deep in the interior of this big state, are not all that expensive from Seattle. I’m big into travel hacking and getting free flights, but when the flights are so cheap, it’s actually kind of wasting your miles on the cheap flights when they could be redeemed for a much more expensive international flight. I’m part of the Alaska Airlines Mileage Program and I’ve got their mileage credit card, so one of the perks is their $120 companion fare, meaning you can add another passenger to the same itinerary for much cheaper. One round trip was normally $380, but adding on the companion fare brought it up to $500 for the both of us, saving us each over $100 on the ticket. Good deal! We were off to Fairbanks Alaska! If you’re coming to Fairbanks to try and see the Northern Lights (among other activities) then you’re going to be coming in winter or during the shoulder season. During all my research I kept seeing that March was one of the best times to come. It offers longer days (unlike the paltry 3 hours of daylight offered on the winter solstice), warmer days (it can get to a mind boggling -40 F in the winter), better road conditions as things begin to thaw, and still excellent Aurora viewing chances (from April through August you pretty much can’t see the Aurora from Fairbanks). But here’s more details about when the best time to see the Northern Lights is, and what you should consider even after deciding on a particularly month. They say if you stay at least three nights in Fairbanks you’ve got an 80% chance of seeing the Aurora during that time. 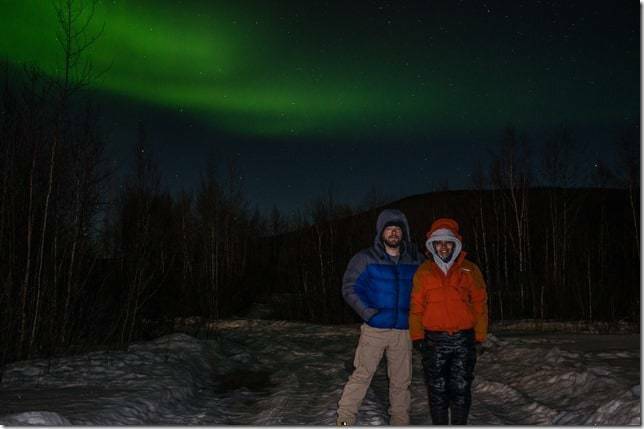 We opted to stay for a little over a week on our trip so we could maximize our odds of seeing the Aurora as well as maximize our adventures in and around Fairbanks. When considering the dates you’ll be visiting, be sure to check the moon cycle calendar–you will have optimal dark skies when there is no moon. I’d try to make that my midpoint on my trip if I could (IE three days before that, and three days), although we didn’t have the flexibility in our dates because we were doing our first ever house sitting gig and then left the following day. Beyond the time of year that you go, you’ll still need some dedication and luck to get an amazing aurora show. We dedicated ourselves to trying to see the lights nearly every night while in Fairbanks, and there is certainly a huge variability in the strength and intensity of the show. The standard is a slow (almost not moving) arc of green that you can see hanging overhead. With clear skies and dark nights, you’ll probably most definitely see that. The best and most mesmerizing display is when it gets more intense and starts “dancing” across the sky, emitting other colors in the cascade of light raining down from blueish to reddish hues. To see the best show though, you need to have some dedication, which might mean waiting and watching for hours at a time. When it does erupt in a big show, it might last for just a few minutes and then fade back to normal. Trust me, it’s worth it to try and see a big show. It’s unlike anything else I’ve ever seen and will certainly take your breath away. The days immediately before and after a new moon (when the skies are darkest) are the best times to plan your trip. Beyond on that, keep an eye on the aurora forecasts online when you arrive in Fairbanks and make the biggest efforts on days with the most promising forecasts for both weather (clear skies) and aurora activity (higher intensity). On our flight up to Fairbanks it was the middle of the night and we caught our first glimpse before we even landed. 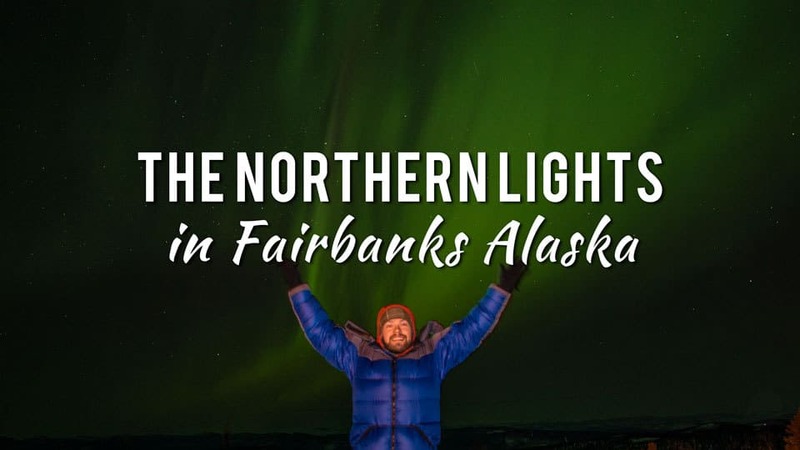 But your best bet is to head to one of the many locations northeast or northwest of town — since you will still be looking northward to see the lights and don’t want the light from Fairbanks interfering if you head south. For our first full night in town we made the 40 minute drive up to the Ski Land lodge where you have access to a warm lodge, unlimited hot drinks, and a live feed of the show outside, so you don’t have to be stuck in your car or waiting in the sub-zero temperatures ($30 per person). It was a more comfortable introduction to aurora borealis hunting. We shared the lodge with dozens of Japanese tourists–they actually make up a huge portion of the aurora tourism each year, interestingly. Beyond the heated auroriums and ski lodges, you have plenty of options. The best bet is to drive outside of town at least half an hour so you can get the darkest skies and escape the light pollution. Head north up the Steese Highway toward Fox and find somewhere to pull over (there’s a free parking lot near Ski Land as well). 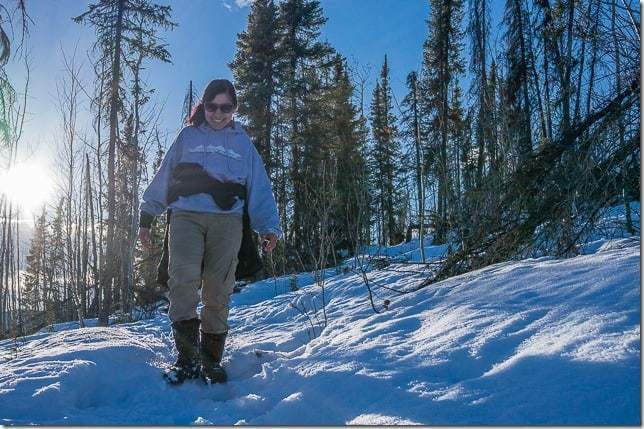 Head toward the Chena Hot Springs and search for an open view (usually best toward the north). Or head west out of the city toward Ester or Murphy Dome for unobstructed views. If you’re not looking to head so far out of town in the middle of the night in winter (be sure the roads aren’t too treacherous!) then you can also catch a good display from right in town. Creamer’s Field is an excellent open area with great visibility right on the north side of the town and was our preferred place to catch the show from town, though we also heard good things about the University of Alaska Fairbanks. It’s also a lovely pass to go for a short walk through the winter wonderland during the day. – Warm clothes–big puffy jackets, insulated pants, insulated boots (I brought along my ice climbing boots), and warm gloves or mittens. The cold in Alaska in the winter is very real! Those little chemical hand and foot warmers can be a nice addition as well. – Warm drinks–bring along an insulated thermos like the Hydro Flask and fill it with hot water, tea, or coffee. A warm drink (perhaps even with caffeine for those long nights) will do wonders. 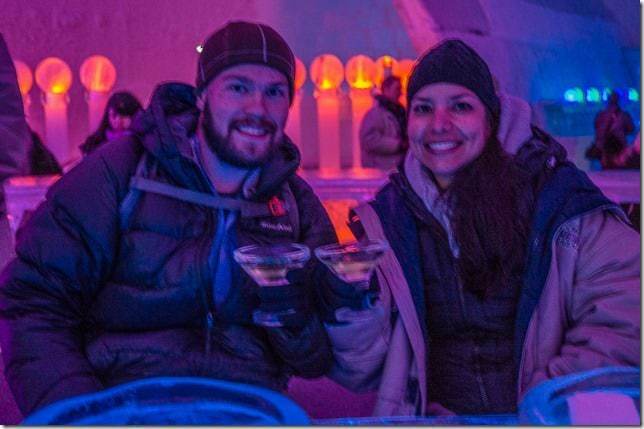 – Snacks and food–we took on a somewhat strange schedule in Fairbanks–staying awake until 4am often to watch the Northern Lights and then sleeping until about noon. Heading out for the Aurora at 11pm or 12am, left us hungry in the middle of the night. – Bring your patience–again patience and dedication is absolutely necessary if you’re looking to see the biggest and most impressive displays. Definitely worth it! – Charge your batteries–if you’re hoping to catch the lights on camera, be sure to have your batteries fully charged, and a wiped memory card to capture hundreds and hundreds of shots through the night! Who hasn’t read a Jack London novel and dreamed about Alaska dog sledding as they dash through the snow in the cold white north? 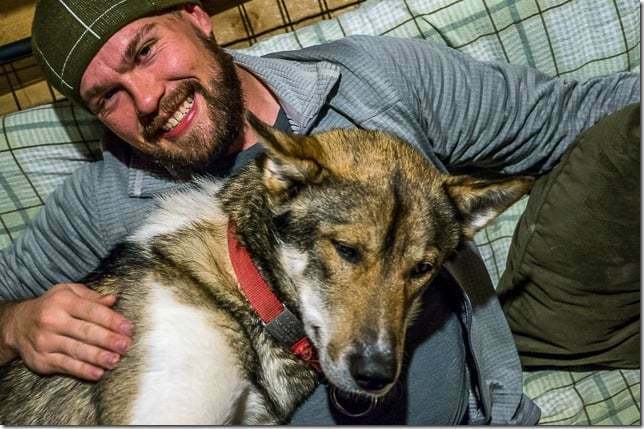 We connected with the folks up at Sirius Sled Dogs for a memorable afternoon and evening with their amazing dogs. We went for two runs, one longer one in the later afternoon, and another in the middle of the night, which was especially magical as the aurora started peaking out overhead. 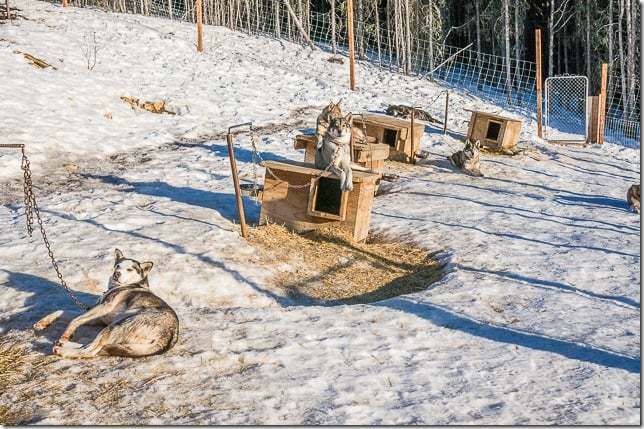 If you go to Fairbanks in the winter–you have got to go dog sledding with Sirius Sled Dogs. Trust me. 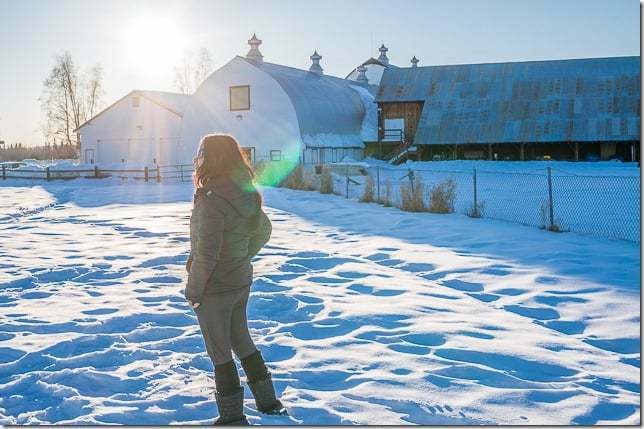 They’ve also got an incredible vista for the aurora… Professional aurora photographer Ronn Murray often brings his students/clients to their property to take photos of the dogs as well as the aurora. 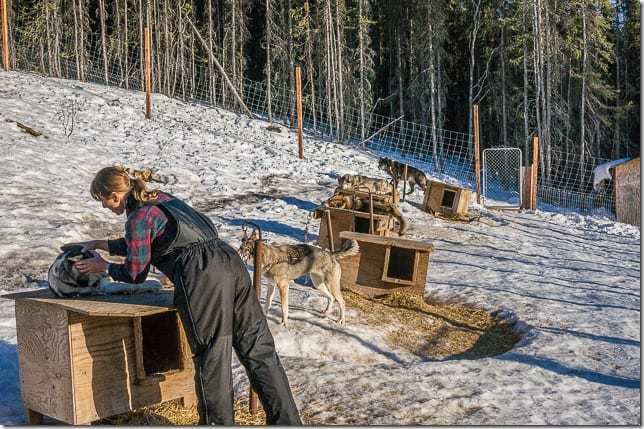 If a day of dog sledding in Fairbanks, Alaska is out of your budget, perhaps you can at least attend a local dog sledding competition and witness the intensity and determination of these amazing animals. 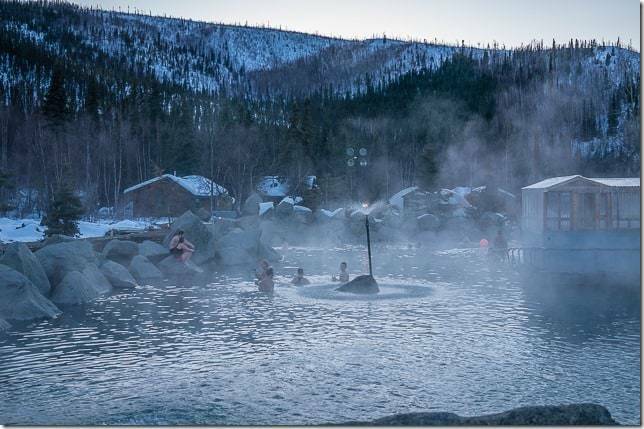 It may be at or below freezing, but don’t let that stop you from hoping in your bathing suit and traipsing through the snow to take a dip in the famous Chena Hot Springs. It’s a great way to relax and soak in the winter world of Alaska. They have a few pools where you can relax for the day. 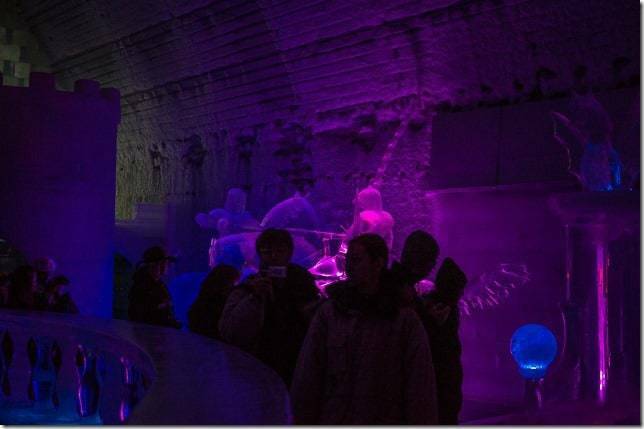 You can couple your visit to the Chena Hot Springs with a visit to their ice museum where everything is made out of ice. 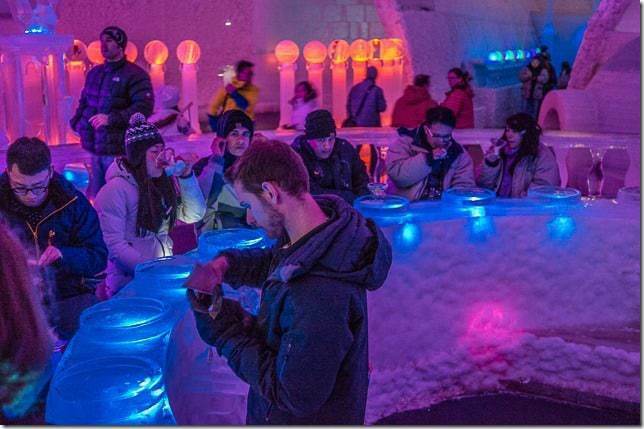 The ice museum even includes a real bar made out of ice, and you can even get a cocktail in a glass made out of—wait for it… Ice! We kept the ice glass in the trunk of the car for the rest of the trip… Thanks to the cold temps it didn’t melt at all! It’s a fun and unique thing to do during the daytime. 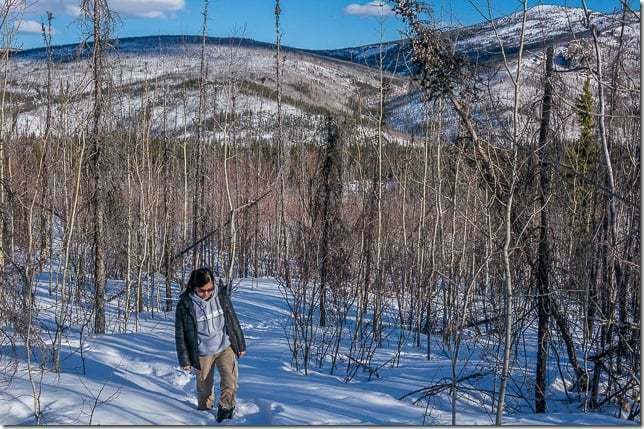 Near the resort you’ll also find numerous hiking trails—you could also go for a short hike through the deep snow, like the Chena Dome Hike. 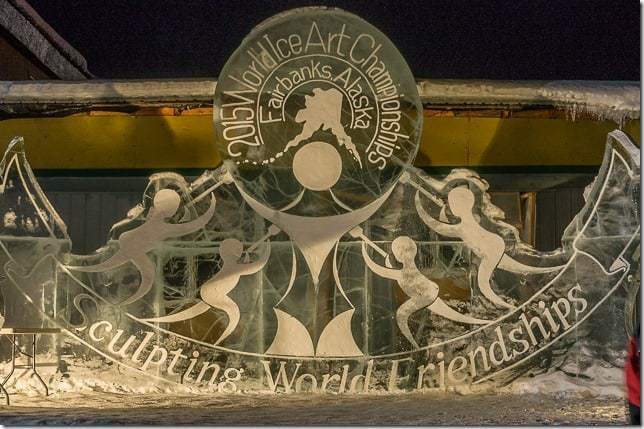 The World Ice Art Championships are held annually in Fairbanks where world class ice sculptors gather to create the biggest, most elaborate pieces of art. 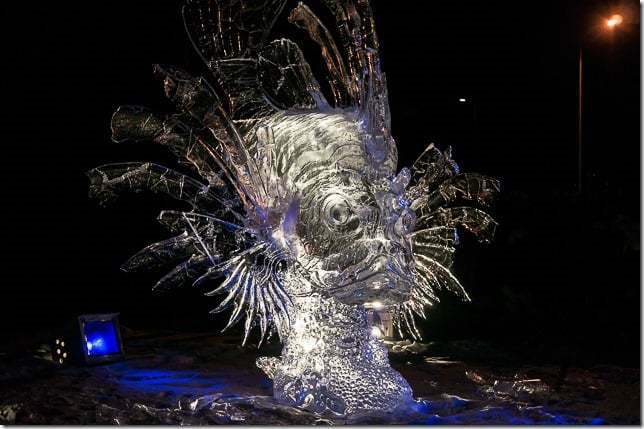 Walking among the dazzling displays is another must-do in Fairbanks. We arrived just as temperatures were starting to heat up, which unfortunately meant that some sculptures began to fall apart, but they were still breathtaking. 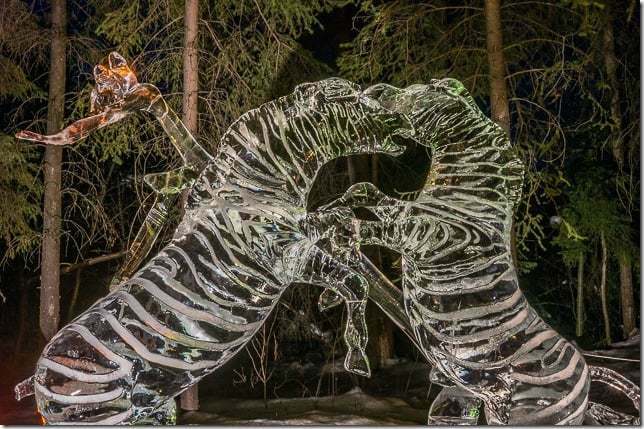 It’s amazing the skill and dedication of the people who create these works of art and which end up melting away into a puddle of water by the end of the season. 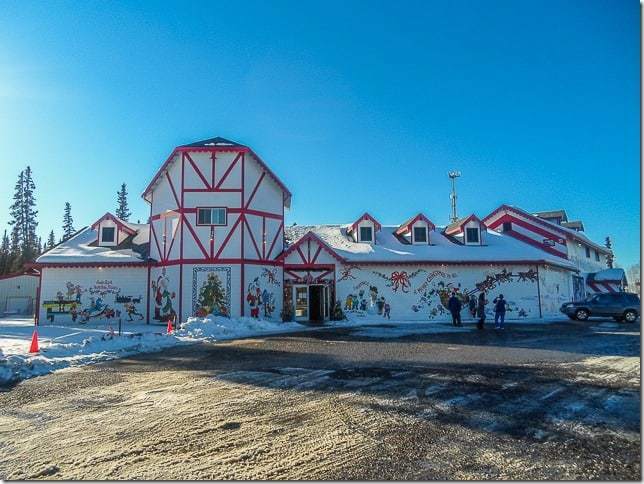 If you’re looking for another fun, somewhat silly thing to do during the day time, you can also take the drive to Santa’s Workshop in the North Pole and send a letter to loved ones stamped from the North Pole. 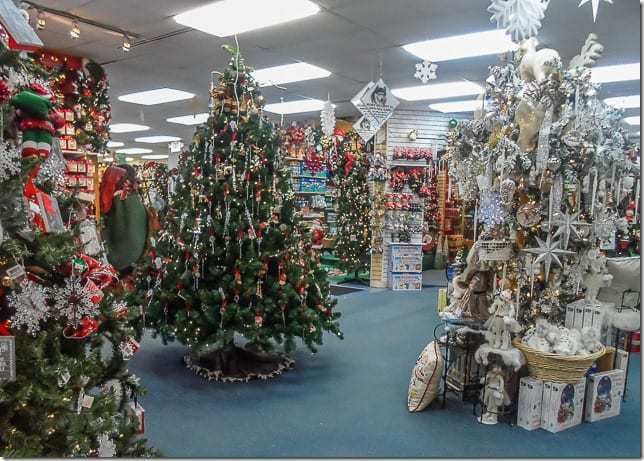 It’s all Christmas, all the time at this little outpost just outside of Fairbanks. It makes a nice drive as well as a good place to buy souvenirs for family. 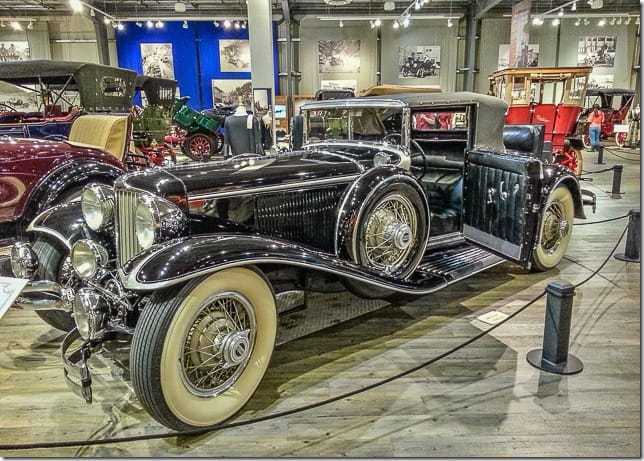 For something totally different, be sure to visit the Fountainhead Antique Auto Museum… Even if you aren’t a “car person” like me, you’re sure to get a kick out of this trip through the history of antique automobiles. They have a collection of extremely rare cars that portray the evolution of the American automobile, and even go through some of the history of automobiles in Alaska–something that doesn’t seem remarkable at first blush, but when you think about just how remote and relatively unpopulated Alaska was, it makes for a quite interesting story. Fairbanks is a small little town of about 50,000 people, but they’ve got a decent number of hotels in the area due to the tourist demand year round. 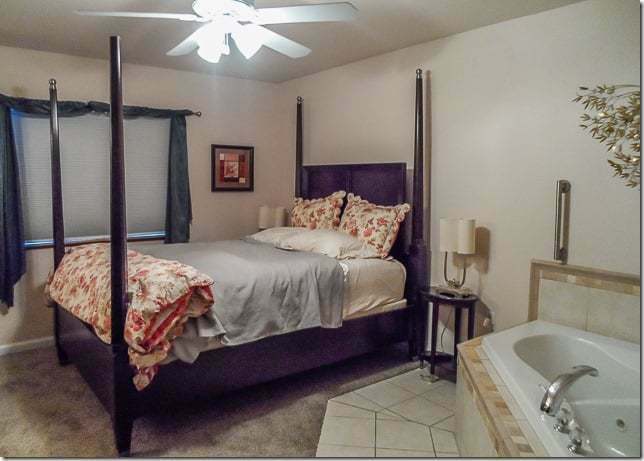 For our first nights in town we wanted to stay in a smaller, local place instead of just some massive hotel chain, and stayed at the Minnie Street Bed and Breakfast located on the northeast edge of town. 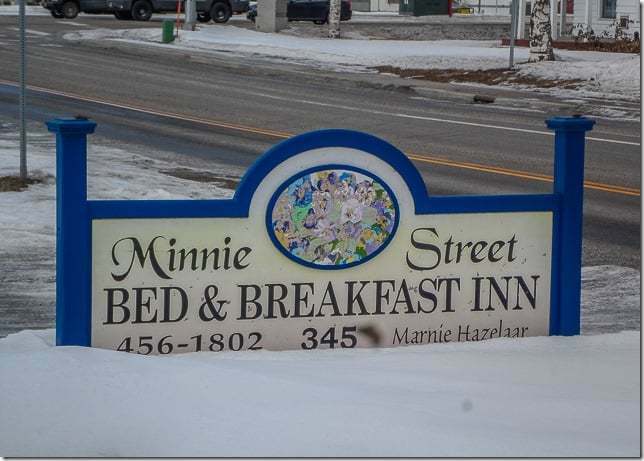 The Minnie Street B&B is a great little bed and breakfast in Fairbanks with a handful of cozy rooms that are spread out over a few different small buildings on the property. The rooms are relaxed and homey, and provided us with a most excellent home base to explore the area. 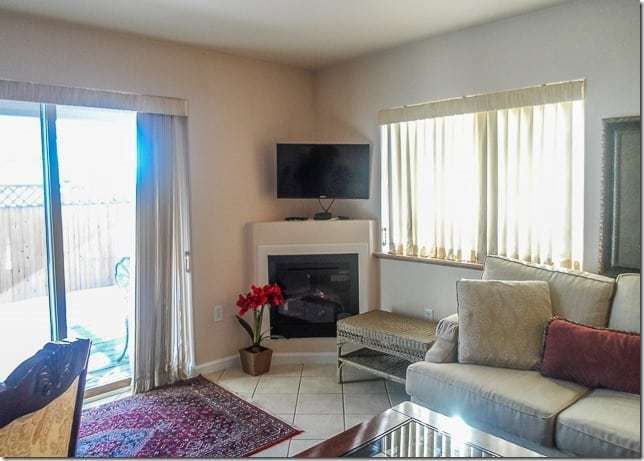 They’ve got rooms ranging from a standard small and cozy hotel room to their deluxe suite which is basically a fully furnished apartment all to yourself. Having a kitchen was not only extremely convenient (not having to head out first thing in the morning for breakfast) but also allowed us to save a bit of money by cooking most of our meals or preparing hot drinks to take out aurora hunting. Staying in the suite for a few nights was incredible—and made our celebration of Andrea’s birthday even more special. The location itself is also excellent–near Creamer’s Field where you can best catch the Northern Lights from town, close to the Steese Highway so you can head out a little further to watch, near Walmart for cheap shopping as well as the historic downtown with all the restaurants. I highly recommend staying with the friendly folks at the Minnie Street B&B. When you first get to town, be sure to visit the Explore Fairbanks visitor center near downtown. They have a great and informative staff that will help you plan the last minute details of your trip and provide up to the minute updates about road conditions or other things to consider. You may also learn fun random things from them, like how Fairbanks has truly world class Thai food, and a plethora of Thai restaurants to choose from. Quite strange! Especially for a town of its size, and considering just how remote it truly is. While Fairbanks is a small town, it is a town spread out over a huge area. It isn’t really viable in my opinion to go up there and not have a rental car. Many hotels offer free airport shuttles, and there are taxis that you can call, of course, though those tend to be a little pricey. You could also rely on commercial tour operators to take you out of town on big buses in order to try and see the lights. But again those are pricey, and you’re always stuck working off of someone else’s schedule—and the night you book might not be the best aurora conditions or weather. 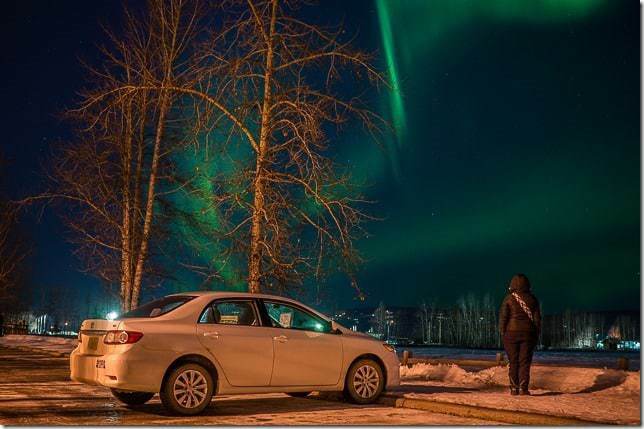 Renting your own car gives you the freedom to move around town, visit the sites you want to see, when you want to see them, pick up groceries and other supplies from Walmart, and to get outside of town to see the Northern Lights. Or just spontaneously pick up and head to Denali National Park or Anchorage, like we decided to do. I talked to a number of people leading up to this trip and one company’s name that kept popping up was that of Alaska Auto Rental. Alaska Auto Rental is a small mom and pop auto rental company competing against the big boys of Alamo, Hertz, National and others. But where Alaska Auto Rental really shines is in their specialization for the Alaska rental market. As mentioned, Interior Alaska in the dead of winter is a pretty cold and frigid place. With temperatures that can drop well, well below freezing, you NEED a car that is adapted to life in those conditions. Indeed, you’ll see most cars driving around Fairbanks equipped with an extension cord poking out from the hood… This is so you can plug in your car overnight in parking lots and keep it warm enough to start in the morning. 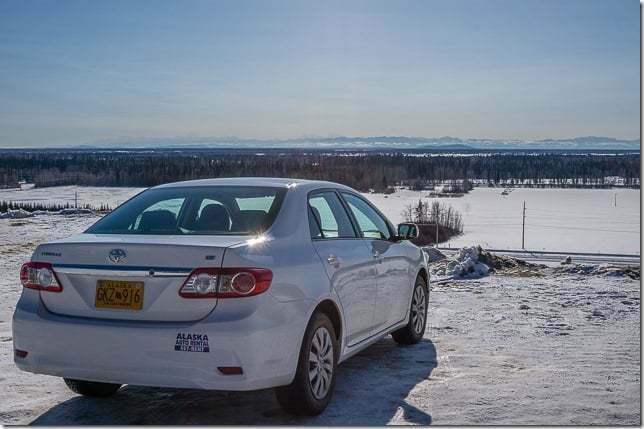 Alaska Auto Rental is also kind enough to offer a free hotel pick up, so that if you fly into Fairbanks in the middle of the night and take a taxi to your hotel, you can get to their office the next day and grab your rental. 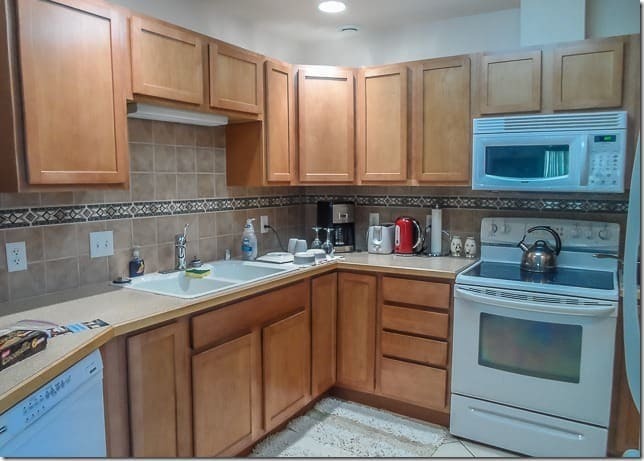 They also collaborate with some hotels to leave your car at the hotel parking lot, take the hotel’s free shuttle, and Alaska Auto Rental will come pick up the car afterwards. Very handy, and a service you won’t find with the big name companies. If you’re looking for a car rental in Fairbanks, Alaska, I can’t recommend Alaska Auto Rental enough. It was awesome to have the freedom of our own wheels in Alaska. Fairbanks in the winter is an incredible place and has been one of the best and most memorable trips I’ve ever taken. 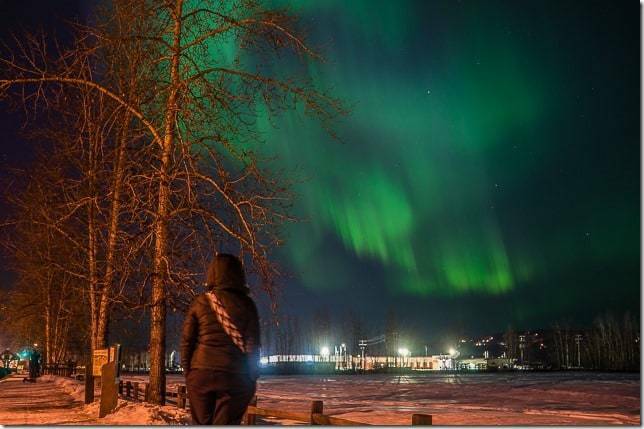 If you’ve ever dreamed about seeing the aurora borealis for yourself, Fairbanks is also one of the best and most accessible places to see it (and see it reliably). Plus there are a myriad of other fun and memorable activities to do in the area. Be sure to visit Explore Fairbanks for more info about the area and don’t miss my more comprehensive article about things to do in Fairbanks Alaska in the winter. Make it a priority to go see the Northern Lights in Fairbanks Alaska this coming winter for an amazing and unforgettable trip. 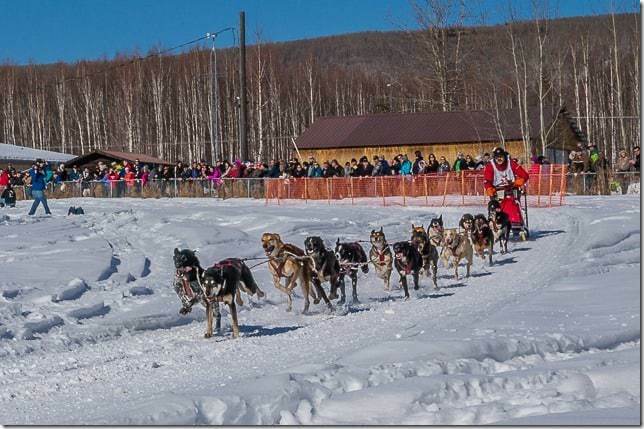 Traveling to Fairbanks on your next trip? Book the perfect room on Booking.com today! Please be sure to Like, Share, or Tweet this post if you found it helpful or interesting. Thanks! Thanks for the wealth of knowledge and for sharing your experience. We just moved to Anchorage and are planning on taking the railroad to Fairbanks for the Christmas holidays. We have our hotel and rental car reservation. We will be in Fairbanks for three full days and hopefully get a lot accomplished (our plans are flexible since we have a 2 yr old and a 5 yr old). Wish us luck that we get to see the Aurora Borealis at least once :). Peace and Blessings. I am really enjoying reading about your experience. 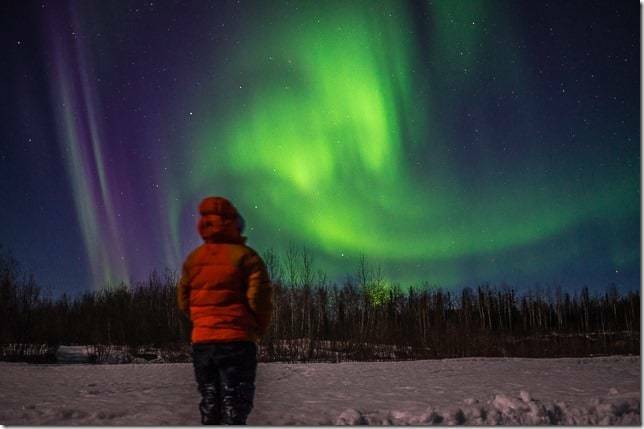 We are heading to Fairbanks in late January, 2019, to fulfill our bucket list of seeing the Northern Lights. We are flying in and renting a vehicle, we’ve already booked a motel but we will wing the rest of the trip. We plan on being there for a week….so hopeful the lights show themselves at least one night. I’m sure with a week you will almost definitely be able to see them at least once! But yeah, it’s good to be open and flexible and just wing it. That’s what we did too. We had a week, but then after we saw the lights the first few nights, we opted to road trip south to Anchorage, but that wasn’t planned initially just so we could make sure we would see the lights! Enjoy! After reading this post, I really wanna spend some time in Alaska. I really try this dog sledding. Thanks for sharing this amazing post with us. Great article really helps others planning a winter trip. I want to drive from ancorhage. I wi’ll be solo. How far is it hours driving. Are the roads dangerous. Would it be better to fly from ancorhage. Hi Ryan! This post was a great read. Planning to head there Feb or March next year. I’m still convincing my friends to go with me. 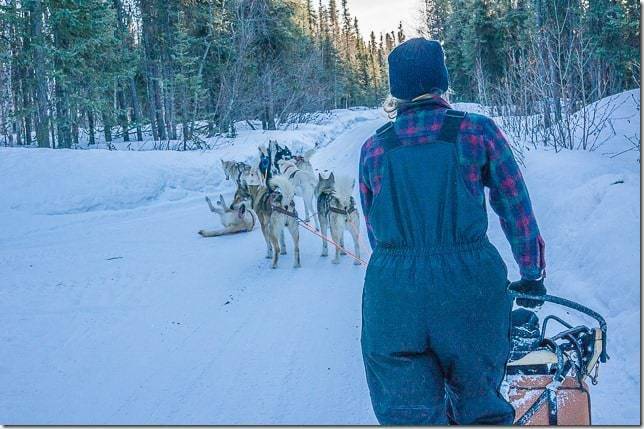 Are the activities (dog sledding etc.,) offered in Fairbanks best cater to a larger group or solo/couple is ok too? 🙂 thanks! Hey! As far as I know, you can go solo (we went as as a couple) and there you will meet up with other individuals or couples also taking part. The sleds only take two guests at a time (one in the bucket, one on the back rails, and then the driver, of course) so going in a group doesn’t really matter, since you’d have to be divvied up anyway. We just alternated throughout the late afternoon and evening doing rounds and then hanging out in their cabin. This is a great article! Thank you for sharing your experience. 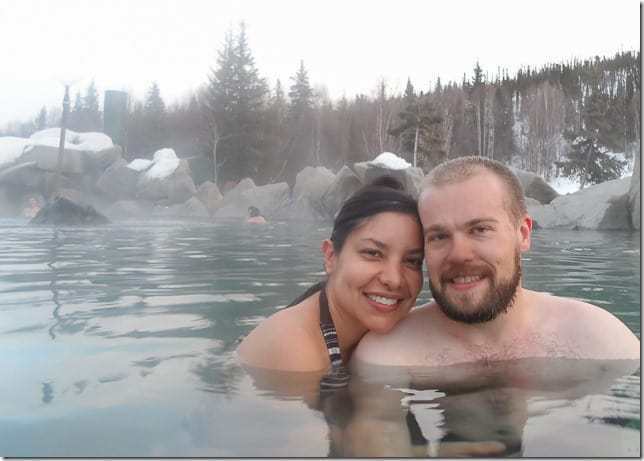 Did you drive from Fairbanks to the Chena Hot Springs? If so about how long did it take? I want to go to the HotSprings but their Shuttles are pretty pricey ($250 for a couple round trip). Thanks! As I recall it was only about 45 minutes or so to get to the hot springs! It’s not that far, and totally doable in a rental car… We did see a giant moose standing in the middle of the road late that night on the way back, so just take the drive slow and easy. This is amazing and soooooo informative! Thank you so much! Heading there late this month, and now I’m more excited than I was before to see the Northern Lights! Thank you! Awesome, so glad to hear it, Heather! Have an awesome trip, and I hope the Northern Lights gives you a spectacular show. Yeah, like I mentioned above, we just headed north out of town toward Ski Land Lodge, Chena Hot Springs, or the Ester and Murphy Domes. All great locations, but you can also see it from right in town quite often. Creamer’s Field is a good place if you can’t get out of town. I am traveling to Fairbanks tomorrow and I am looking for rental cars with drivers as I am new to US and I don’t want to drive there. Could you please suggest me what to do ? Hey Manuela! The roads, generally speaking, were in pretty good shape and the cars come equipped with winter tires. The only danger I ever saw was one night when a moose was standing in the middle of the road! 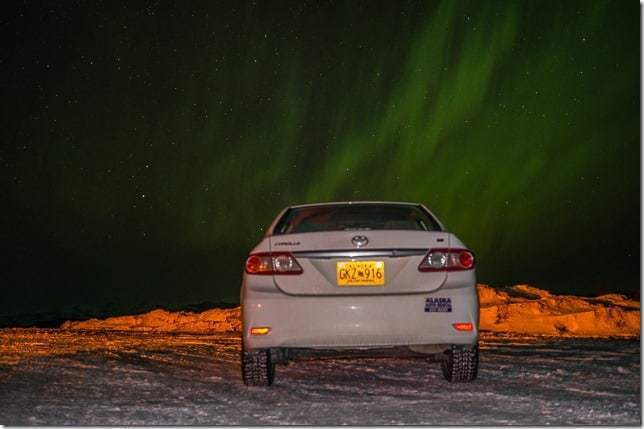 The plus side of renting your own car is the freedom to go when and where you want for the aurora (if you book a bus tour, you might go pay for a night when it is overcast or a weak aurora, or have to return to town when the show is just getting good). Downsides are driving late at night. But if there haven’t been any storms, I would highly recommend getting your own wheels, honestly. Best part of Alaska Northern Lights. My wife and I celebrated our 50th wedding anniversity in Alaska in 1998 one week one a ship & one. week by bus. Hey Bill, they are truly an unforgettable experience, aren’t they? So cool to hear you cherish those times nearly 70 years after the fact. Thank you for the information — we are heading up at end of March (new moon) so hopefully will see the lights this time (we went to Iceland last year and didn’t get to see them). Also, signed up for a dog sled experience — really glad now that I read your blog. Thank you! Awesome, I hope you enjoy it. It’s still one of the most incredible and memorable trips I’ve ever taken. Great video! I went to Fairbanks in winter to see the Northern Lights and I fall head over heals with that city since then. It is a great place to be even in the dead of winter. So beautiful and has a lot to offer. The night spent in Chena Hot Spring outdoor pool and stargazing with my friends, then waiting for northern lights to show up is something one will never forget. Thanks for this written-up, bring back so many memories and also making me miss Alaska so much! Glad you enjoyed the video! Yeah, we still think back fondly to our up north…. It was a week or so packed with really amazing adventures. We would love to get back there one of these days as well, it would be find to find a house sit or something for a bit longer. Cheers! 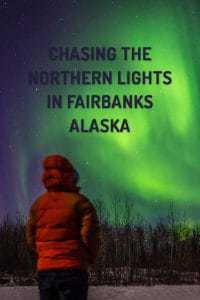 It is a beautiful review about fairbanks trip. Your review contains a lot of helpful information. For rental car, you could look up for “rent neighborhood car”. It would be cheaper than somehow. I am about to go solo end of July this year. I hope i could catch some aurora over there. Really beautiful. I saw Northern Lights and did a visit to husky farm dog, but didn’t do the dog sledding. Sounds like a lot of fun! The Northern Lights are just incredible, aren’t they? Highly recommend the dog sledding, it was also an unforgettable experience. Thanks for leaving a comment! Nice photos, we have not been lucky yet to shoot up the northern lights yet. I’m sure this winter we will get her done! Thanks, David! It really is a breathtaking sight… Make it happen!